This piece came from the gloom of January days. I drew the composition on rice paper in pencil then I went over it in sharpie. When the design is finished I watered down acrylic paint and fill in the images with color. The background is 16x20 canvas with sheet music. When the background is completed and dry I carefully glue the rice paper on with clear acrylic polymer to give it a very protected surface. If there are changes to be made I wait till the rice paper is dry. Wow, you like to listen to Joni Mitchell too! Music does inspire art. I am intrigued by Joni's album and song Coyote, perhaps I will have to sneak one of those wild dogs in my Amon Basin scroll project. THis has a right, happy feel about it Gail. 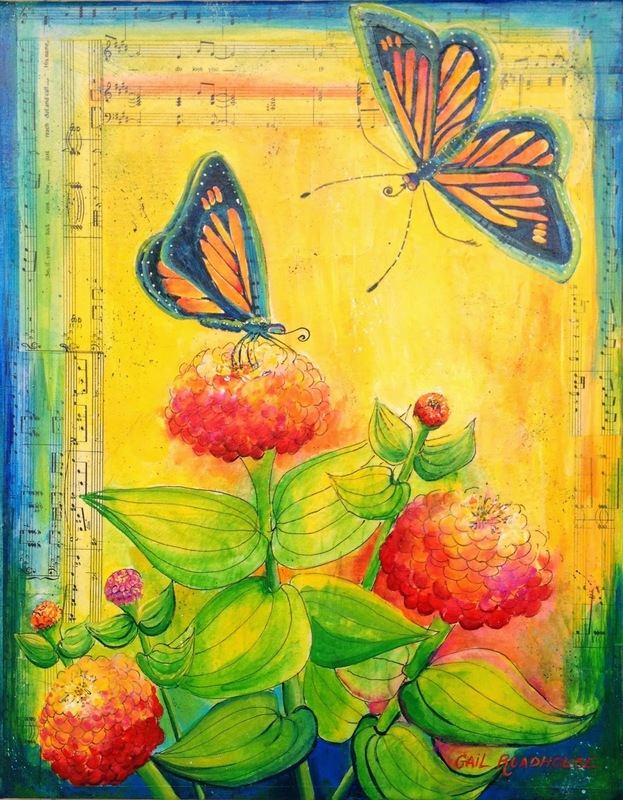 I like the soft music collaged in the background … and also the restful tones behind the butterflies. Nice job on the mums. That's just lovely and great design!